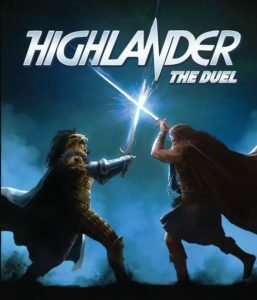 Concepts: In Highlander: The Duel, two players compete to defeat one another. The titular duel is played out over a series of rounds, with players alternating between offensive and defensive moves and playing cards in order to block and attack. The first player to deal twelve points of damage to their opponent is the winner. Writing: There is no writing or storyline component to this game. It is not narrative in any way. Mechanics: Each turn, players draw a hand of five cards. These are drawn from the deck, of which the first two cards are placed face-up and all others in the deck are face down – the face-up cards are replaced once a player selects and takes them, giving the player the chance to either select one of two known card or gamble on an unknown card. The active player, starting with the one who chooses to play as the Kurgan, is then the attacker. The other player, taking the role of Connor McLeod, is the defender, and these roles alternate between rounds. Players then place one card from their hand to the table, with a goal to match or mis-match icons that are listed at the top of the card – cards can have any of up to five icons in total, and each card typically contains two. If the defending player matches an icon that is on the attacker’s card, that constitutes an attack which has been blocked. If an icon is not matched, that attack causes one point of damage to the defending player. There are situations in which cards and powers will allow a defending player to deal damage to an attacking player, including each character’s special abilities (for example, once Connor has taken five points of damage he is able to do so), but these special abilities are static and each player has only two of them which become active as you lose health. Finally, each card also contains a set of secondary icons which, if matched with a set of secondary icons from a previous card, would allow the player to execute a combo move, which has the effect of enacting an effect that is listed on the card. All of these are fairly tricky to obtain and only situationally useful. After four such clashes, the round is over and the defending player becomes the attacker, until such times as one player either dies or, like with our play of this game, they stopped playing. Design: Each card contains nice artwork. It is both gloomy, to establish the mood of the storm-wracked duel, and colourful to give the effect of the power between the combatants. The card stock is sturdy. 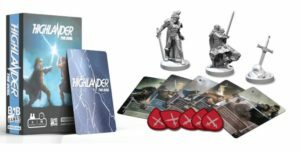 The miniatures, which one could argue were the centerpiece of the game’s Kickstarter project, do nothing and play no part in the game. One can be used as an active player token, but even that feels like a stretch. Playability: Despite our best attempts to give Highlander: The Duel a fair shake, we simply found the game to be extremely dry and lacking. Even bearing in mind the limited scope of the project – to recreate a single duel between two players, it feels that very little in the way of eagerness to innovate or drive the player’s fun factor was included in this game. Not every game needs to attempt to reinvent the wheel, but they should at very least strive to be enjoyable and fun, and sadly this particular game plays less like an epic clash of immortal titans and more like a slightly upgraded game of ‘snap’. 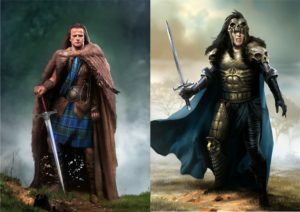 Conclusion: We at the Cybe’s Website team are big fans of the Highlander film and were very eager to give this game a try, but at the end of the day we cannot recommend it to anybody. It simply lacks the depth or excitement that the premise offered, does nothing of any significance with the very nice miniatures that the game comes packaged with, and gives no real fun. FINAL THOUGHTS: Sadly this duel plays out more like a game of ‘snap’ than it does a clash between ageless immortals, and although it might kill ten minutes it certainly doesn’t keep getting back up for more.